For many years, Dr. Jilani and his team have been educating clients on the damaging effects the sun and the environment has on the skin. Many treatments performed at The Island Cosmetic Clinic are used to combat this damage. Although many of our clients inform us they are using sunscreen and do not sunbathe, unfortunately this is not good enough. Sunscreen alone only gives you only 50% protection from the harmful UVA ageing rays. SPF concentrates on the UVB burning rays and the number such as 50 means you can be out in the sun 50 times longer without burning. UVA rays are much stronger than UVB rays, they are present all year round and can penetrate glass. These rays damage the deeper layer of the skin (the dermis) which holds the skins elastin and collagen. Over time repeated exposure to UVA can lead to mutations such as skin cancer. That’s why at The Island Cosmetic Clinic we recommend SkinCeuticals skin care products. SkinCeuticals skin care was formulated by Professor Sheldon Pennell, a dermatologist in Texas, USA. He produced a topical antioxidant by stabilising L asorbic acid, the part of Vitamin C that the skin uses to prevent skin cancer. He discovered from his case studies that through its use, the health and appearance of the skin improved, pigmentation began to fade, fine lines reduced and new collagen formed, creating a glowing complexion. These antioxidants combined with his sunscreen not only corrected the damage that had already occurred, but it also prevented new damage. This resulted in slowing down the ageing process of the skin. Professor Pennell then went on to produce a whole range of cosmeceutical skincare products to help keep the skin healthy and combat skin problems including acne and rosacea. Dedicated to developing advanced skincare backed by science SkinCeuticals has earned a strong reputation with the medical community worldwide. 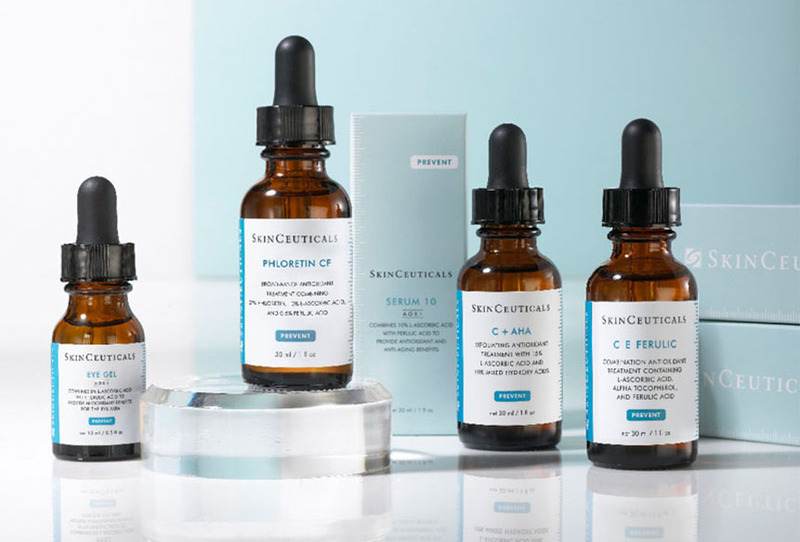 SkinCeuticals provides complete skincare solutions through dermatologists, plastic surgeons, and other skincare professionals in the United States and in over 35 countries worldwide. These experts trust SkinCeuticals to promote skin health – not trends. The SkinCeuticals research team helped pioneer the advent of ‘cosmeceuticals’ with the development of a topical vitamin C formula that is scientifically proven to protect skin from premature signs of ageing caused by environmental damage. SkinCeuticals skincare is backed by science and continuing studies keep the products performing at its best. SkinCeuticals products cannot be compared to over the counter products, as they work deeper into the skin. The best protection from UVA radiation is to wear a broad-spectrum sunscreen that blocks both UVA and UVB rays. All SkinCeutical sunscreens contain Z Cote (microfine zinc oxide), which protects from both UVA and UVB rays. The body uses antioxidants to protect itself from free radical attack caused by UV exposure. Supplementing the body’s natural reservoir of antioxidants with a topical serum from SkinCeuticals can provide additional protection from premature ageing. Using a combination of antioxidants and a broad-spectrum sunscreen is one of the most effective ways to protect yourself from premature ageing as well as improve existing environmental damage on your skin. This revolutionary new antioxidant combination delivers an unprecedented 8 times the skin’s natural protection against photo aging – neutralising free radicals, helping build collagen and providing unmatched antioxidant protection. More protection means more youthful looking skin and better defence against environmental aging. Containing 15% pure L-ascorbic acid and 1% alpha tocopherol, the addition of ferulic acid doubles the already synergistic benefits of our original high-potency formula, C+E thus transforming it into an unrivalled super-antioxidant combination. Phloretin CF™ represents a new class of preventive and corrective topical antioxidant treatment. After five years of extensive research, SkinCeuticals developed this patent-pending breakthrough technology combining the newly-discovered, broad-range power of phloretin with vitamin C and ferulic acid in a bio diverse formulation to divide and conquer sources of damage at every level. Ideal for sensitive skin types or conditions to help restore healthy looking skin, Serum 10 neutralises free radicals, defends against environmental damage and helps prevent premature signs of aging. Now formulated with AOX+ advanced antioxidant technology, this lightweight, fast-absorbing serum combines ferulic acid with 10% pure vitamin C to enhance antioxidant performance. There are 3 different antioxidants and sunscreens available for different skin types. A free skin scan and assessment can be arranged at The Island Cosmetic Clinic, so that our skin care specialists can select the right products for you. In order to ahieve the best results, please always ask for expert advice before you start using these products. They are designed for different skin types, and improper use can cause irritation. Please call 01983 880180 to make an appointment at the clinic for a skin assessment. What are SkinCeuticals Topical Antioxidants? Topical Antioxidants are Vitamin-C drops applied to the face, that neutralises damaging free radicals (toxins) in the skin. These free radicals released by UV rays from the sun, are responsible for lines and wrinkles, pigmentation marks and thus destroying our natural collagen. Applying an antioxidant daily stimulates collagen production in the skin, and prevents premature ageing and over time, visibly improve skin clarity, tone and texture and minimize the appearance of fine lines and wrinkles, leaving skin with a firmer, smoother and younger looking appearance. Studies show that once absorbed in the skin the topical antioxidant remains for days and can not be washed, rubbed or perspired off. Rather than use SkinCeuticals Topical Vitamin-C products, can’t I just rub oranges on my skin or take more vitamin-C tablets? No. SkinCeuticals Topical Vitamin-C products contain vitamin-C in the form of L-ascorbic acid at a precise acid pH which allows it to be absorbed by the skin. No matter how much vitamin-C one ingests, body control mechanisms tightly limit the amount of vitamin-C that can enter the skin through ingestion. Until Dr. Pinnell and his colleagues at Duke University proved that L-ascorbic acid at low pH is necessary for vitamin-C to be absorbed by the skin, the only way to feed the skin vitamin-C was through diet or vitamin supplements. Duke University research shows that stabilised L-ascorbic acid at low pH delivers 20 to 40 times more vitamin-C to the skin than can be achieved by diet or by supplement. Research also shows that vitamin-C is necessary to stimulate collagen synthesis. What is the difference between SkinCeuticals Topical Vitamin-C products and other skincare products which feature vitamin-C as an ingredient? SkinCeuticals Topical Vitamin-C products contain stable L-ascorbic acid at a low pH, which allows vitamin-C to be absorbed by the skin. Most commonly marketed products utilise vitamin-C derivatives such as ascorbyl palmitate and magnesium ascorbyl phosphate, which must be converted to L-ascorbic acid in order to be used by the skin. To be effective, vitamin-C derivatives must first get into the skin and then must be chemically converted by the skin’s cells into L-ascorbic acid. Because the skin is difficult to penetrate and the enzymes necessary to convert these derivatives into L-ascorbic acid are not always available, derivatives are not very effective in delivering vitamin-C into the skin. It is the Duke University patented technology and the stability technique developed by Dr. Sheldon R. Pinnell and his colleagues which renders the SkinCeuticals Topical Vitamin-C products effective. In addition, SkinCeuticals Topical Vitamin-C products are designed to reduce the temporary stinging sensation that was inherent in early topical vitamin-C formulations. How often should SkinCeuticals Topical Vitamin-C products be applied? Like daily vitamins, the recommended regimen for SkinCeuticals Topical Vitamin-C products is one application per day to help diminish the appearance of fine lines. Using the products more than once a day may cause irritation. Therefore, they should only be applied more frequently if directed by a skin care professional. Because topical vitamin-C photo protects the skin from harmful UVA and UVB rays, daytime application is ideal. Duke University research shows that once topical vitamin-C gets into skin, it cannot be washed, rubbed, or perspired off and it remains active for up to 72 hours. Therefore, SkinCeuticals Topical Vitamin-C products are ideal for active individuals and athletes who spend a good amount of time outdoors. How soon does an average user see results? SkinCeuticals Topical Vitamin-C products will start to be absorbed by the skin almost immediately. Because these vitamin-C products were developed as a preventative treatment with the goal of protecting the skin from further environmental damage, the skin should benefit the moment the vitamin-C is applied. Vitamin-C is necessary for the production of collagen, the major structural protein of the skin and although visible differences will not be seen for approximately two months, you may notice a visible difference in skin texture, color and tone in as early as a few days. The appearance of fine lines and wrinkles should become less noticeable within three to eight months. Individual results may vary, depending upon the condition of the skin at the time of initial use. To what extent have SkinCeuticals Topical Vitamin-C products been used by the public? Today, there is a network of thousands of dermatologists, plastic surgeons, and licensed Aestheticians that recommend SkinCeuticals Topical Vitamin-C to their patients daily. Many individuals now benefit from the stabilised L-ascorbic acid technology. SkinCeuticals Topical Vitamin-C products are physician recommended and patient preferred, with the number of satisfied users continuing to grow. Are there any side effects associated with SkinCeuticals Topical Vitamin-C products? Less than one-tenth of one percent of all people using SkinCeuticals Topical Vitamin-C products has had any difficulties. Some individuals experience a mild stinging when the product is first applied, which is attributable to the high acidic concentration necessary to get the L-ascorbic acid (vitamin-C) into the skin. Many individuals find this sensation subsides with continued use, specifically as the skin begins its natural healing process. SkinCeuticals’ extraordinary Topical Vitamin-C products are specially formulated to benefit the skin with less discomfort. This unique stabilization process provides higher concentrations with minimized irritation. Is this product suitable for use on all skin types and colors? At what age should you start using these products? It is never too early to protect the skin from photo ageing. I use a high factor sunscreen. Is my skin adequately protected? 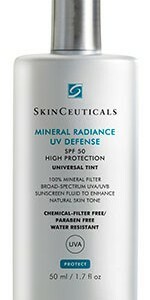 It is important to wear a Broad spectrum sunscreen like SkinCeuticals which protects you against both UVA and UVB rays. The two essential ingredients in the sunscreen that you should look for is Titanium dioxide and Zinc oxide. Most sunscreens available in the shops do not contain both these vital ingredients. Recent legislations in the USA have made it mandatory for all sunscreens to contain Titanium dioxide and Zinc oxide, so please check your sunscreen for the above ingredients. I don’t sunbathe. Do I still need to wear sunscreen? Remember that it is the UVA rays from the sun which damages the skin, causing ageing and we are exposed to the harmful rays all year round and yes, even in winter. A Broad spectrum sunscreen should be worn 365 days a year even when it’s raining and snowing. Don’t think of it as sun, think of your protection as a safeguard against UV damage. Am I fully protected with a good sunscreen? No. A broad spectrum sunscreen gives only 50% protection from the harmful UV rays. Most dermatologists and plastic surgeons recommend using a Topical Antioxidant like SkinCeuticals Vitamin-C as a daily skincare treatment to protect the skin from premature ageing. I only use sunscreen in the summer. Is that ok? No. You should use a Broad spectrum sunscreen all year round in combination with a topical antioxidant. How much sunscreen should I apply to my face? Research suggests that most people are using 25% of the recommended amount of sunscreen. Use plentiful and cover all exposed areas to get maximum protection. What else would you advise for my skin? Use a combination of topical antioxidant and broad spectrum sunscreen every morning, all year round. It is never too late to start using these two essential products even if you have been exposed to the sun over many years. It will repair the earlier damage and protect the skin from further damage from the harmful UV rays of the sun. Avoid the sun between 10am and 3pm when the UV rays are at their peak. Wear a wide brim hat when out in the sun. Never use a sun bed (or stop using it if you are). Avoid sunbathing. Use fake tan if necessary. If in doubt get expert advice from a specialist dermatologist or cosmetic physician. They can offer a skin scan to show the specific areas of damage to your skin and advise you on effective treatments.